We quite liked the Huawei Ascend P6, it was power packed enough and it was beautiful to look at. The Ascend P6 is one of the slimmest smartphones if not the slimmest smartphone measuring at 6.18 mm which garnered it a lot of positive attention and now there is a internal document leak which gives us a few juicy details about its successor, the Ascend P7. According to a leaked internal document, the Huawei Ascend P7 will feature a 5-inch Full HD (1920 x 1080) TFT display. There’s a HiSilicon Balong 910 chipset with a Quad-Core 1.6 GHz processor and 2 gigs of RAM. It will come with 16 GB internal storage and a microSD card slot. There will be a 13 MP rear camera with LED flash and a 8 MP front facing camera for well, perfect selfies i guess. All this will be powered by a 2460 mAh battery and the device will come with LTE connectivity. The Ascend P7 will run Huawei’s EmotionUI 2.0 over an unspecified Android version. The document also mentions that the device will be made of exquisite materials and we hope it is as thin as the Ascend P6 if not more thinner as the report suggests that it’ll be quite similar looking to the Ascend P6. 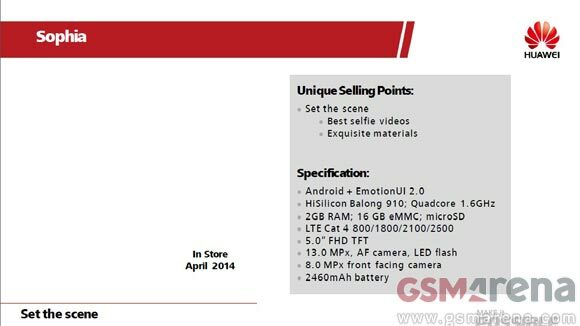 Huawei also mentions in the list of USPs that the Ascend P7 has the ability to take “best selfie videos” hinting to a good front 8 MP shooter. We can expect the Ascend P7 to be released to the world in April as the document suggests.